Sweet, smoky and juicy are some of the words that come to mind when thinking of a smoked turkey. These specially cooked birds are a favorite for many holiday meals, but can be served to your family and friends any time of the year. You may be able to find a fresh whole smoked turkey, but most of the varieties in stores come frozen. Thaw smoked turkey in the refrigerator just like fresh turkey, for about 4 hours for every pound of turkey. After it's thawed, your cooking time will be short, as smoked turkeys are already fully cooked. Place the thawed turkey into a roasting pan or other large baking pan with 2-inch high sides. 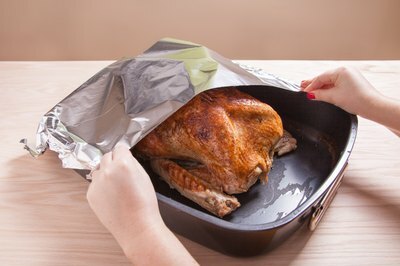 Cover the turkey loosely with aluminum foil. Turn your oven to 325 degrees Fahrenheit and allow it to preheat for 10 minutes. Place the pan with the covered turkey into the preheated oven. Allow the turkey to cook for seven minutes per pound. Check the turkey after the designated cooking time has passed. 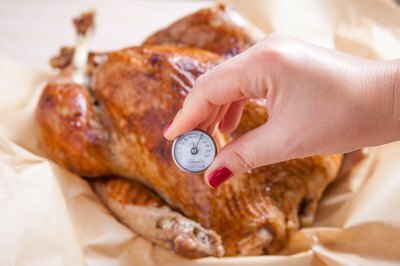 Push a meat thermometer into a thick part of the breast without touching any bones. If the thermometer registers at least 165 degrees Fahrenheit, your turkey is done. 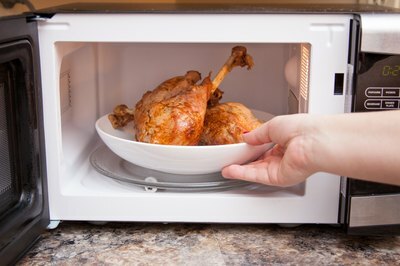 Cut your turkey into manageable portions if you don't have a very large microwave. Fit the pieces into a microwave-safe pan or dish. Place the turkey in a pan into the microwave oven. Turn the oven on 75 percent power and cook the turkey for five minutes per pound. Remove the turkey and pan from the microwave oven. 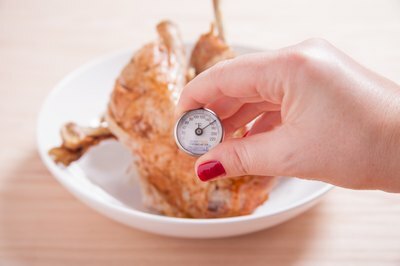 Check the turkey temperature with a meat thermometer. If the meat registers at least 165 degrees Fahrenheit, your smoked turkey is heated through and ready to serve.